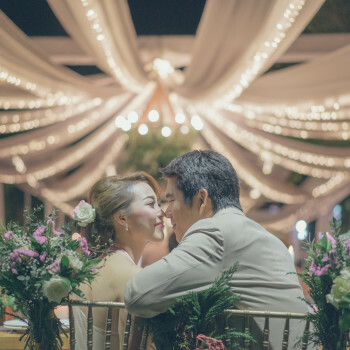 All love stories are different and so start since the very childhood. 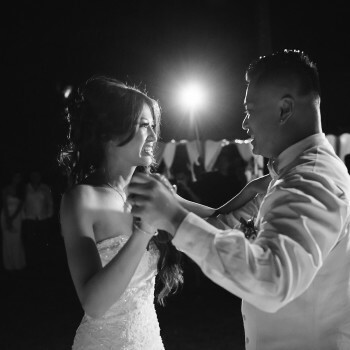 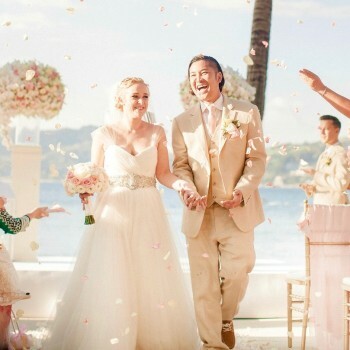 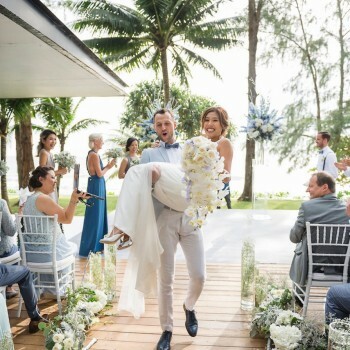 Tiara and Mike knew each other since they were 5, their parents being good friends for years, and as years passed, their friendship developed into a close romantic bond, that brought them eventually to celebrate their wedding among closest family and friends in beautiful Phuket. 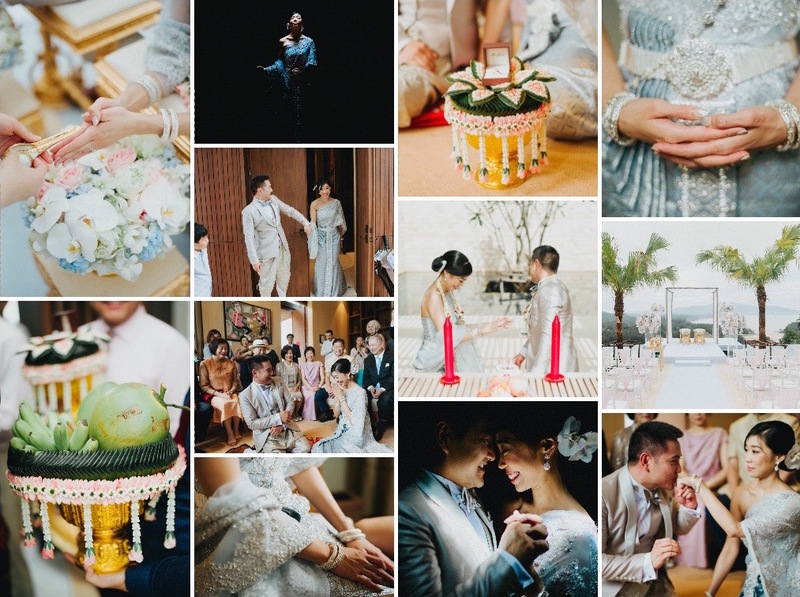 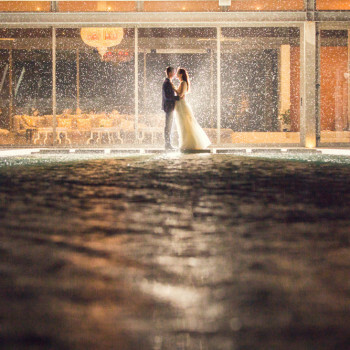 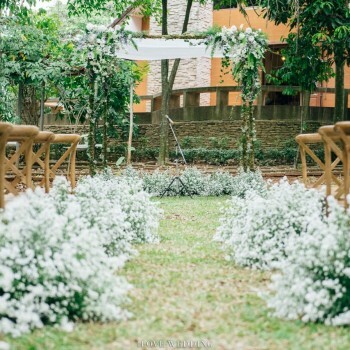 Keywords for this wedding were elegant, intimate, and relaxed. 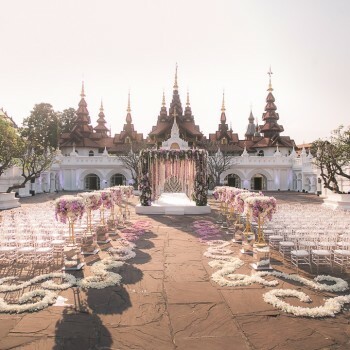 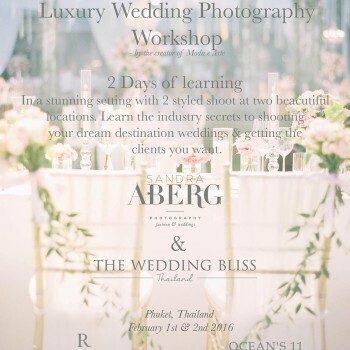 As we often do, we needed to include both traditional Thai wedding with parents permission and water blessing ceremonies, as well as western vow exchange during sunset. 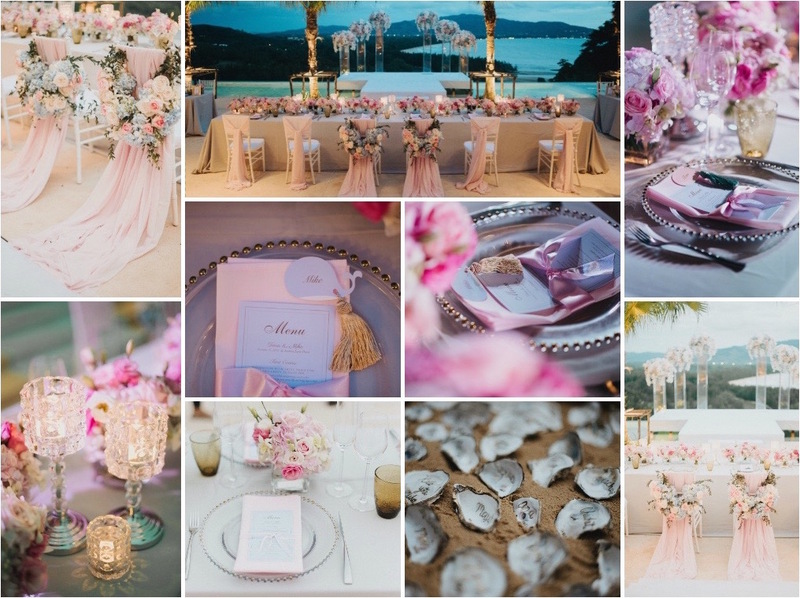 We decided to use the same color palette to ensure a cohesive design throughout the day and focused on soft pinks and serenity blue with a touch of gold. 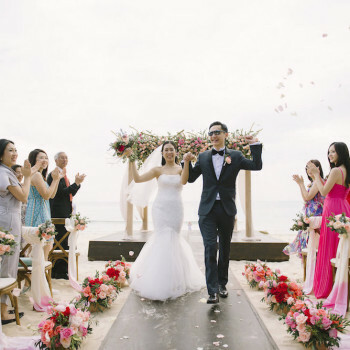 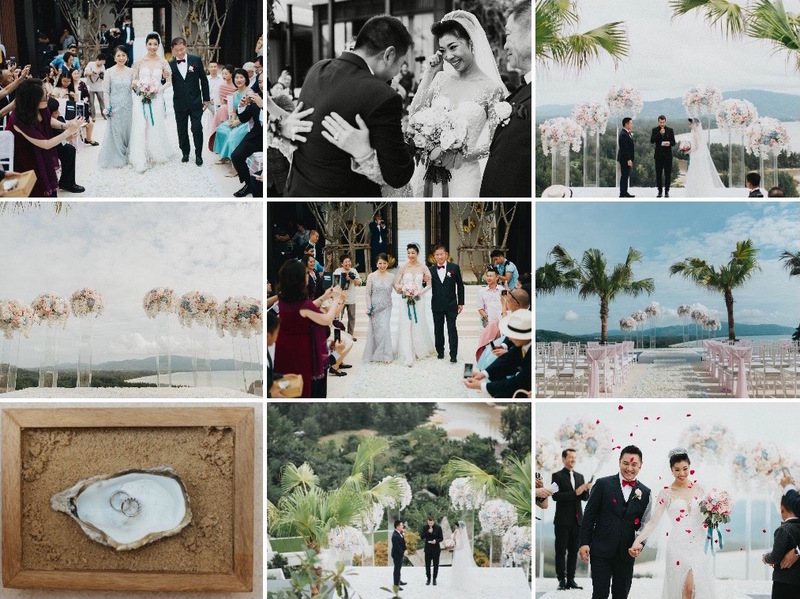 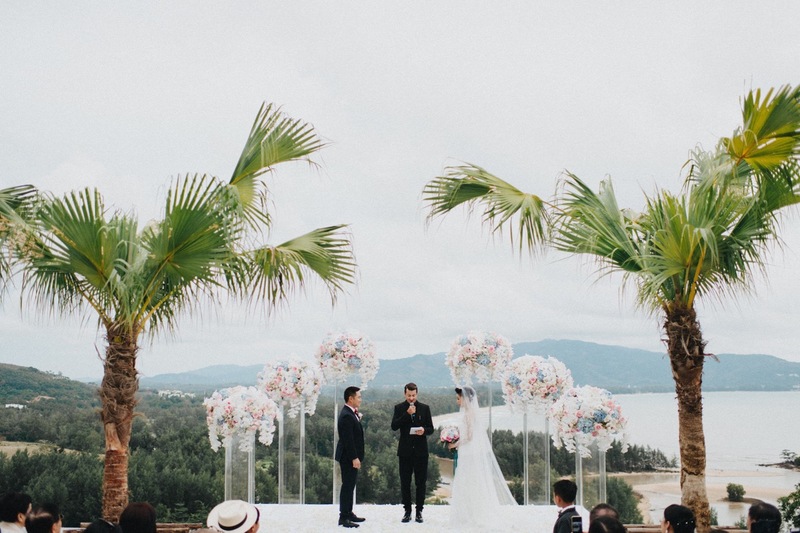 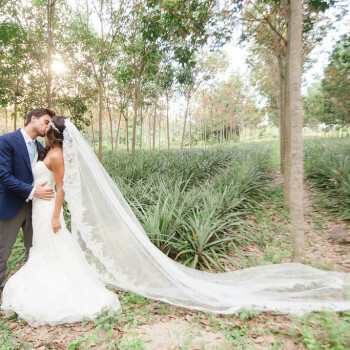 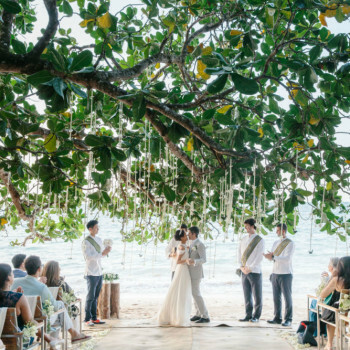 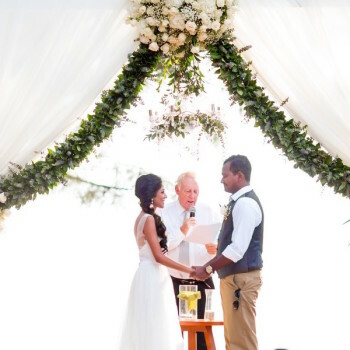 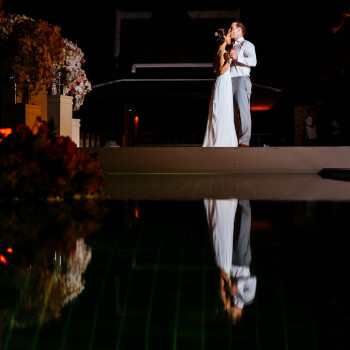 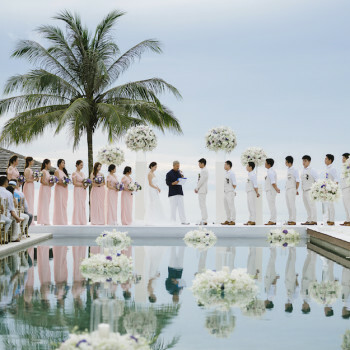 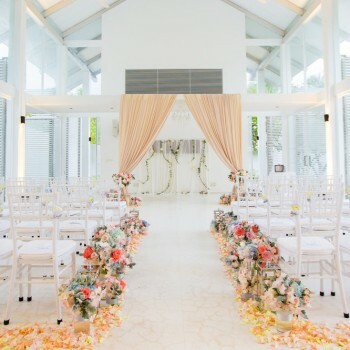 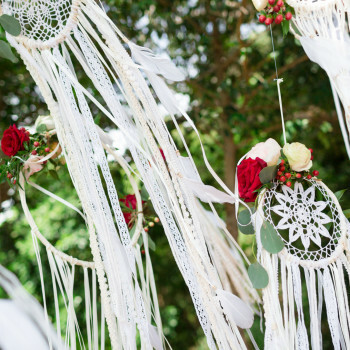 Both Thai and western ceremonies took place on a platform overlooking the beautiful Layan Beach on Phuket’s west coast, allowing guests to catch a glimpse of the beautiful sea and lush jungles. 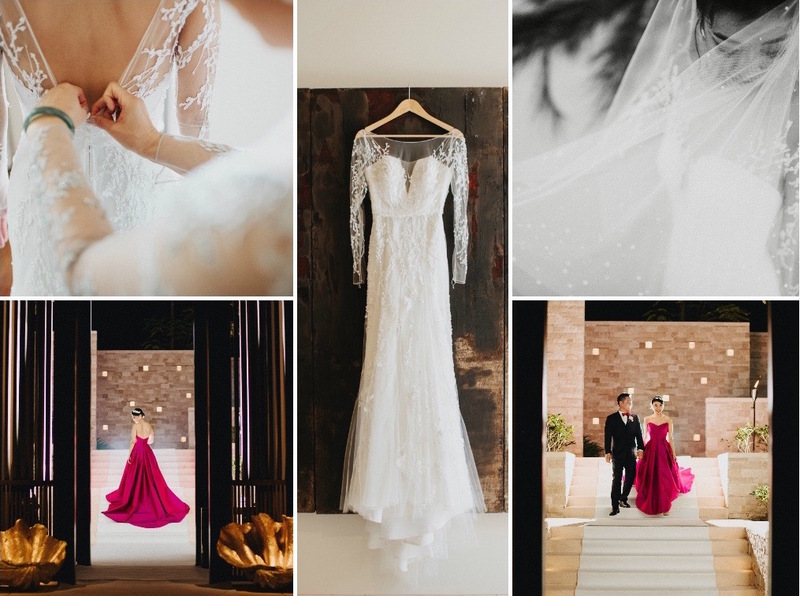 A true fashionista, our bride selected three perfect outfits for each part of her wedding day, all of them custom made to fit her requirements perfectly. 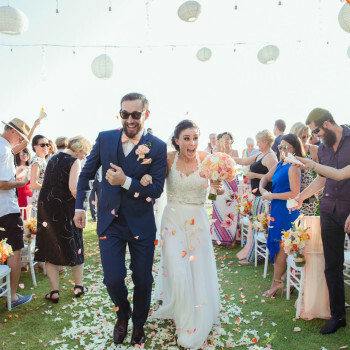 And she looked stunning! 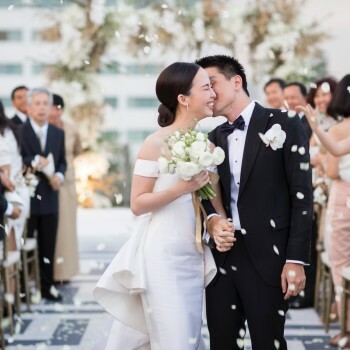 From the first traditional Thai dress, tastefully accompanied by some gold jewelry, then moved to her elegant white gown with delicate embroidery for vow exchange. 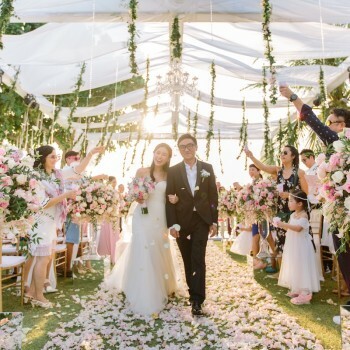 However, her third dress left everybody speechless, as she appeared glowing in her princess-style purple gown with a large train. 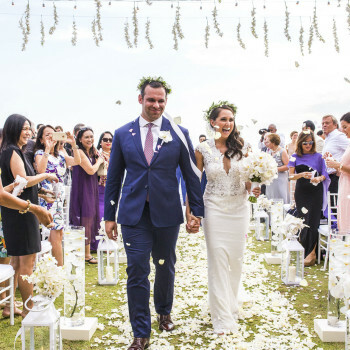 The floral decor of reception dinner contributed to its chic and glamorous atmosphere with a touch of dark purple added to an overall soft color scheme present before. 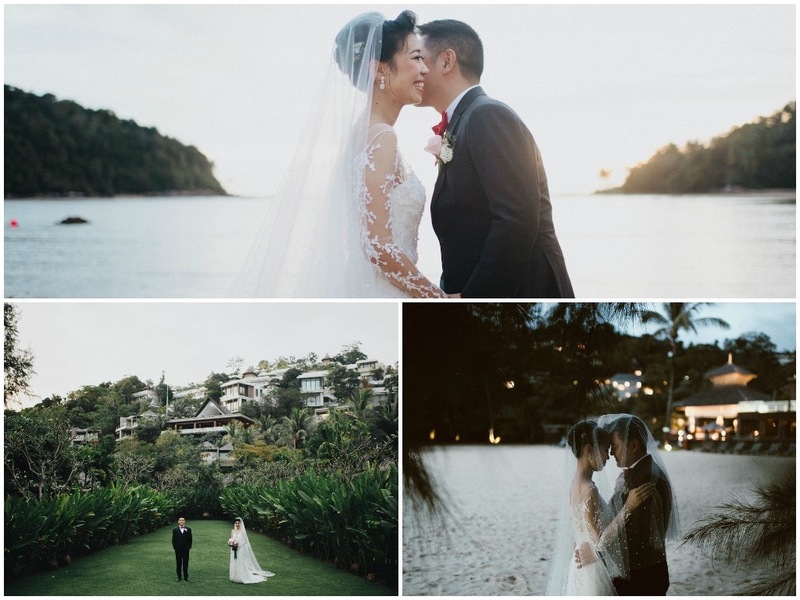 Both being great ocean lovers, with diving as one of their main hobbies, Tiara and Mike added a few significant details about their wedding. 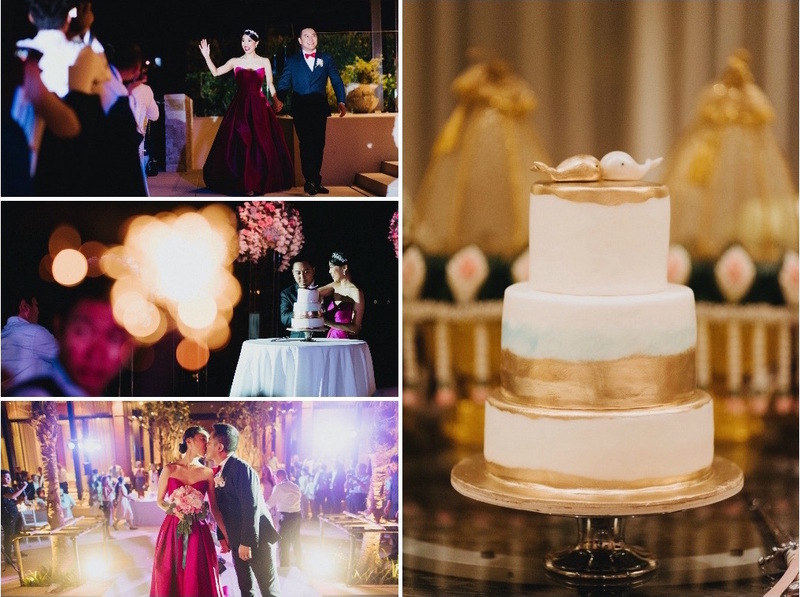 Beautiful whale-shaped bookmarks with tassels as guest favors and two cute gilded whales appeared as their cake topper. 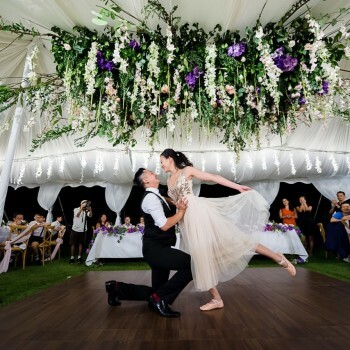 We were also happy to work with the fantastic Terralogical team, who captured the day so gracefully and with their unchangeable artistic touch!